Hello Saint Rose! This blog is going to be a little different, so bear with me. 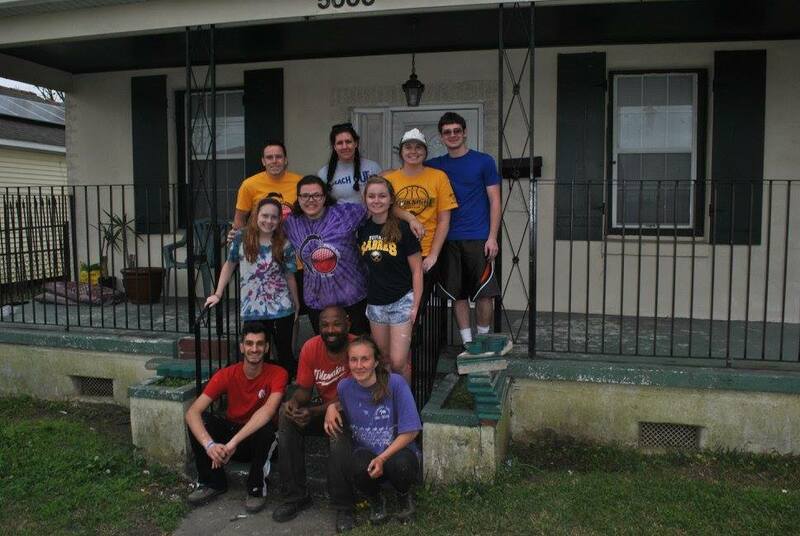 Recently, I had the amazing opportunity to return to New Orleans, LA for an Alternative Spring Break (ASB) trip with a group of amazing Saint Rose students and staff leaders. While in New Orleans, our group was working with a non-profit organization called Lowernine.org, who has been working since Hurricane Katrina to repair homes and give residents of the Lower Ninth Ward the chance to return to their homes and community. As this area was the most impacted due to flooding during the levee breaches as a result of Hurricane Katrina, and home to a large population living below the poverty line, there is still a lot of work to be done 10 years later. It was great to be able to return to New Orleans and see the progress that has been made since I was there last year, but it was even better to spend the week working with fellow blogger Mike! He and I have prepared this blog together, so you get a double dose of what it’s like to ASB as a Saint Rose student! 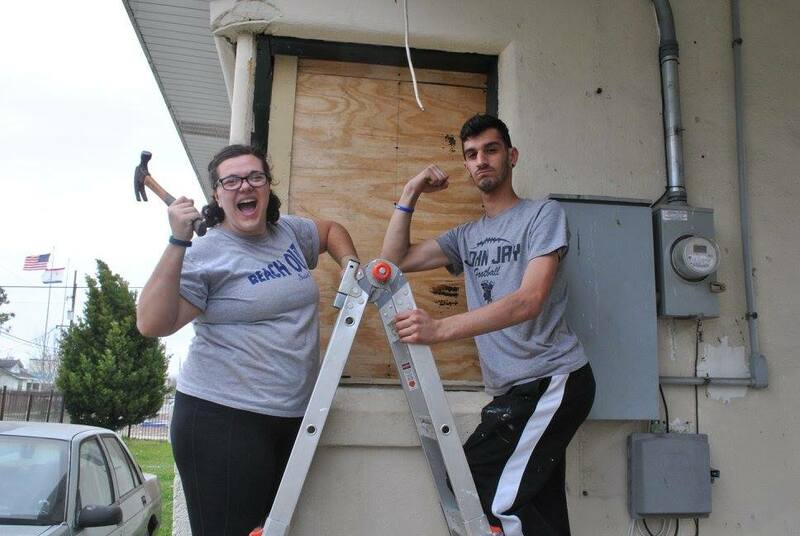 Myself and Mike after we ripped some old plywood boards off of our house. It doesn’t sound like much, but we were definitely sore by the end of the day! Mike, what was it like going on a service trip for the first time? For me, being as this was my first service trip, I really did not know what to expect. I did very little research before we left simply because I wanted the trip to be a completely new experience and it was honestly even better than what I ever could imagine. I really had no idea what type of things I would be doing, seeing, hearing, or even the emotions I’d be feeling. During the week, we worked on repairing a house that was left damaged after Hurricane Katrina and we actually got to meet the homeowners later in the week and they were the sweetest people ever! Even after something as devastating as Katrina, they still maintained their positive energy. One of the homeowners actually came up to each and every one of us working on the trip and hugged us individually and that truly warmed my heart. For me personally, I’ve always wanted to go down to New Orleans and help out. Through Saint Rose, I was finally able to do that. I look forward to (hopefully) participating on another service trip in the future! Maria, what was it like returning to NOLA for another week working in the Lower Nine? It was truly amazing to be back in the Lower Ninth Ward. The organization we worked with is incredible. Everyone there is so full of compassion for what they do and hope for the future. 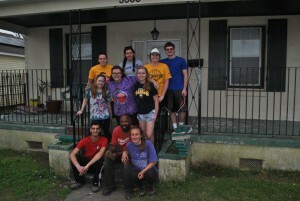 Additionally, the residents of the Lower Ninth Ward are some of the most incredible people I have ever met. Last year, myself and a few others from our group were working on a house that was still extremely bare boned. It was just the framework, but we worked to finish the roof, build a deck, and put siding on the front. This year, we had the opportunity to drive by the house we worked on last year. It was incredible to see that the house was almost finished, painted, and looking beautiful. The Lower Ninth Ward is improving slowly but surely, and I hope that I can continue to see the progress more in the future. What were the biggest takeaways you got from this experience? Maria: I think that my biggest takeaway from this trip, as well as any service that I do, is the social justice issues that drive the work that gets done. Learning about the Lower Ninth Ward and the people that live there was something I looked forward to going back to. This is an area of our country where the odds are stacked against many of the people that live there, whether it be because of race, socioeconomic status, or the challenges of their living environment (for example, the fact that it’s a food desert). We take things for granted so easily, even something as simple as having a Price Chopper right down the road. This trip gave me the ability to take a step back, appreciate what I have, and really focus on why I was doing the work I was. Mike: I had a few “biggest takeaways”, one of which included how many people all have the same end goal; to make a difference. We stayed at Camp Restore, which is a church that was turned into a housing option for volunteers. At Camp Restore, there were 180 people while we were staying there. 180 is a pretty large end number I’d say. 180 different people who want to be the change. That one warmed my heart. My other major takeaway would have to be that living in the moment is okay. For those who know me, they know that I’m constantly going from one thing to another, but when I was in New Orleans with everyone, I was finally able to live in the moment and absorb every little thing. This trip completely changed the way I think and for that, I am grateful. What advice do you have for students who are thinking about doing an ASB in the future? Maria: Do it! But, do it for the right reason. You get as much out of a trip as you put into it. Don’t go on an ASB expecting a vacation, or a week to be a tourist. Go on an ASB with a passion and drive to want to make some sort of impact on the community you are serving. Take time to reflect while you’re there as well, because a change might be occurring inside of you that you could miss it if you’re not paying attention! Mike: Yeah, I definitely agree with Maria on this one. If you do choose to pursue one of the Alternative Spring Break Trips while at Saint Rose, make the most of it. Go into it with a blank slate and leave with it covered. Be open to learning what you may be doing and what that could mean and why you’re performing such tasks. For me, I went in without any biases and I left feeling much more knowledgeable, which made the experience more fulfilling. Most importantly, pay attention to EVERYTHING. Literally, anything and everything you can listen to, is most definitely worth listening to. Our work crew on our last day! Despite the smiles on our faces, we were really sad that the week was over.